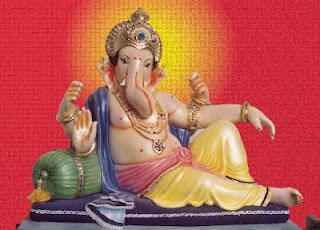 Here is the story about how Lord Ganesha lost his human head and obtained an elephant head. Once Lord Shiva went to some far away place and Godess Parvathi was staying alone. She wanted to have a good person to guard her room. Using the sandal woods and perfumes, she created a statue of a little boy. Then using her power, she enchanted few mantras and gave life to that statue. The little boy was very charming and also strong. Godess Parvathi ordered the little boy to guard her room and went inside to take rest. When the Lord Shiva returned back and was about to enter into her room, the little boy stopped him at the doorstep. Lord Shiva became very angry because of this and using his trishulam He cut the head of that little boy. When the Godess Parvathi came to know about this, she cried and requested Lord Shiva to bring back the life for that little boy. Moved by her words, Lord Shiva ordered his servants to search for the little boy's head but unfortunately they couldn't find it. So Lord Shiva asked them to go back to the earth and bring the head of the first animal they see. The servants on their way saw a white elephant and they brought the head of that elaphant to Lord Shiva. Lord Shiva fixed that elephant head for the little boy and using his power he made the little boy alive again. Lord Shiva and Godess Parvathi decided to have the little boy as their own son and named him as Ganesha.